Admittedly, spring has never been my favorite season. I've always preferred the warmth of summer, the colors of autumn, and the coziness of winter. A lot of that has to with the springs I experienced while growing up in Illinois. They consisted of a mix of chilly temperatures, sleet-filled skies, and soggy sidewalks. Just as I would feel a glimmer of hope, seeing grass blades poking through the snow, a fresh blanket would come hurling from the sky like a cruel joke. Spring (as we think of it with blooming trees, green grass, and mild temperatures) didn't arrive until late May. And when it did it lasted but a fleeting moment. In the past few years I've learned a simple rule: if you want to experience autumn at its finest, head to New England in October; if you want to witness the definition of spring, visit the South in April. Mind you, spring in the Lowcountry is not without its own set of challenges. We have an enormous amount of tree pollen. Everything (and I mean everything) is coated with layer of chartreuse dust. Also, warmer weather means the awakening of many unwelcome creatures, namely alligators and snakes. However, the beauty of blossoming azaleas, fragrant jasmine and wisteria, and bright green bursts of leaves push these minor inconveniences by the wayside. Around this time of year, everything in the late afternoon takes on a hazy, golden glow. The light filters through newly formed leaves turning rustic farms into charming retreats. Weeks ago, what was just a haunted barn standing in a bleak, grey landscape now becomes an enchanting playground....the red wood siding contrasting beautifully with its surroundings. Dirt lanes, peaceful creeks, and moss-covered fences highlight the joys of simple, country living. Soon, our mild temperatures will give way to thick, humid afternoons. Strolls through azalea-lined lanes will be replaced by long walks on the beach. And cool, quiet nights, will yield to steamy evenings filled with the melodious conversations of crickets and frogs. Until then, with a new-found appreciation for spring, I will enjoy the abundant, colorful April days that I am lucky to experience in the Lowcountry. Foggy days are the ballads of the weather world. They make me move slower, think deeper, and feel more. Living among waterways, ponds, and the ocean, these mystical fronts are not out of the ordinary, especially in the colder months. 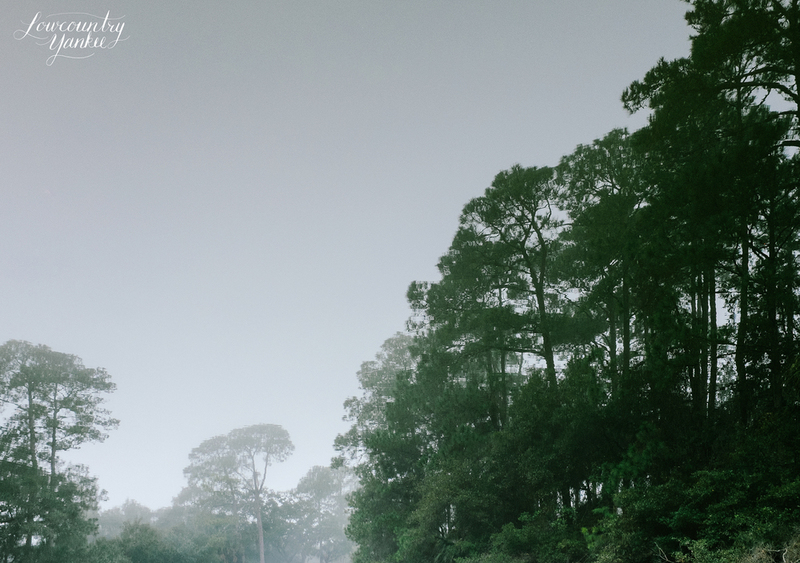 Last winter, the Lowcountry was graced with a particularly foggy day following an Atlantic storm. My mom and I decided to walk the beach to see if the rough waters had deposited any oceanic treasures. (Earlier in the year, the day after a particularly vicious meteorological disturbance, we found an abundance of perfectly intact conch shells littering the sands.) Unfortunately, the limited debris tossed upon the shore this winter's day was of the man-made variety. Specifically, a lone piece of multicolored driftwood sat beached upon the sand. Driftwood washed ashore on a foggy morning at Kiawah. That piece of wood illustrated one of my favorite features of fog: its mysterious nature. The driftwood lay there silently asking countless unanswered questions. I wondered where this wood began its oceanic journey? How did it acquire its layers of aqua, brick red, mossy green, and carnation pink? To whom and to what did it once belong? A boat? A dock? A barn? And where were its companion pieces? Of course, upon discovery of such a scrap on a sunny day, I might have asked myself the same questions. Yet, there was something about the fog that heightened my inquisitive nature. There is something romantically haunting about the South. Large, twisty ancient oaks arc over roadways. Wispy Spanish moss creeps down from their branches, swaying like ghosts in the breeze. The region's tumultuous past only lengthens the shadow cast upon its landscape. Harmonious romantic notions stem from books and films that retell tales of gallant gentlemen and their ladies fair (yes, I'm referencing Gone with the Wind). 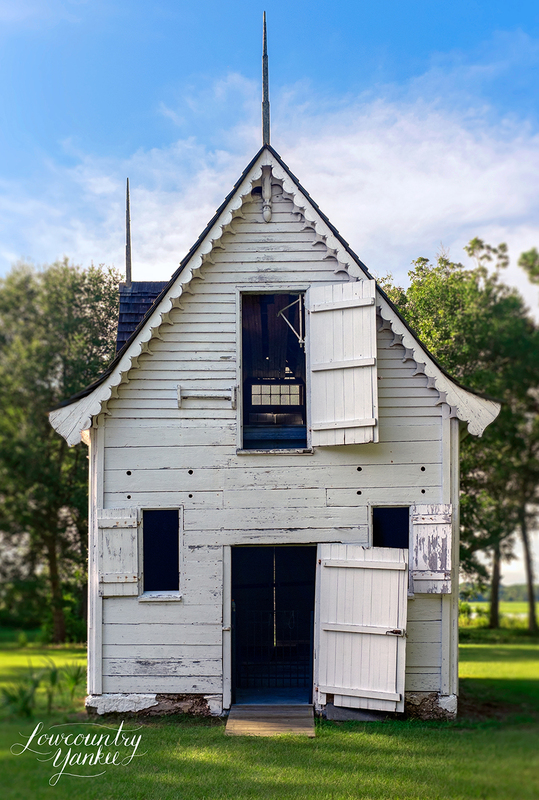 An abundance of abandoned buildings littered throughout the Lowcountry emphasizes these themes. Perhaps they are part of rural America's culture. Though, in the cornfields of Illinois, I do not remember seeing such structures. Nevertheless they are part of Southern life. Somehow, their presence never seems frightening or eerie. When I stumble upon these forgotten fortresses, I feel the same sense of calm and mystery that tends to overcome me at cemeteries. More than anything, abandoned buildings pique my curiosity. I wonder what led them to such a fate. Some have logical explanations, like the boat below which was transplanted when land became sea during Hurricane Hugo. Once the water receded, the Lil Bounty, and many other vessels, remained permanently beached. Other buildings have likely been left behind due to economic hardships or deaths. I find irony in how quickly nature begins to take over abandoned structures. I imagine what the parcel looked like prior to man deciding to construct a building upon it. Perhaps it was a meadow with wildflowers and grasses growing tall. Or it had a widespread tree shading the earth below. A looming, dark forest full of fragrant pines might have been ferociously cleared to make room for a house or gas station. And now, after man has finished his need for the space, nature returns to reclaim its stake. Weeds and tree branches slowly creep up camouflaging bricks, siding, and window panes. The Brainerd Building has been a cornerstone in the landscape of Libertyville, IL since 1917. It was the first high school built in Lake County with students matriculating from as far away as Fox Lake. By 1954, with a newly constructed building located down the street, Brainerd became freshman-only. By 2003, it was reduced to a storage unit. 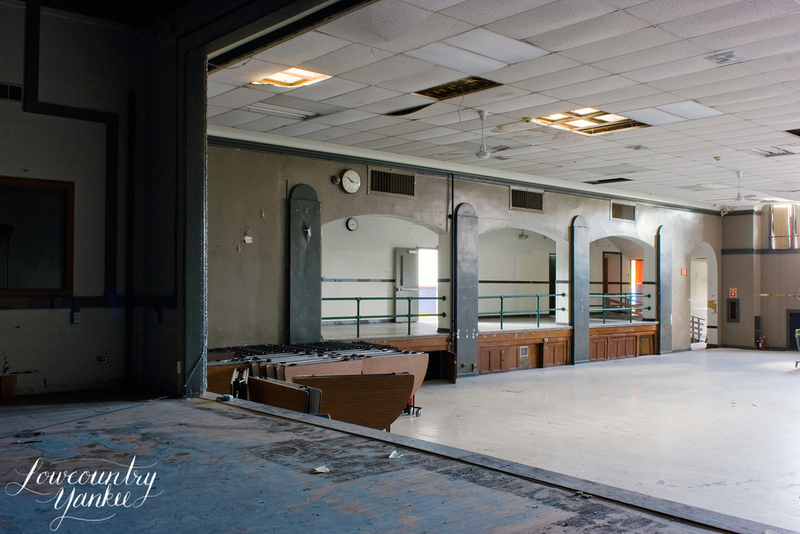 Over the next few years, Brainerd Community Center, Inc., a non-profit organization, attempted to save and restore the nearly 100-year old structure. In its efforts, the group was able to achieve National Register status in 2008 and Brainerd was placed on Landmark Illinois' Ten Most Endangered list. Unfortunately, the enormous cost of renovations ultimately determined the project's fate. With its impending demolition (and as a former BCCI volunteer/board member), I felt compelled to share my favorite anecdotes and photographs shot in 2007/09 . Many famous folks graced the halls of Libertyville Township High School. Most notably, from 1939-1941, Marlon Brando attended the school. During his time there, he was a member of the Curtainraisers Club and the track team. As many recall, he was not the most serious student. Brando's English Literature teacher, Anna Johnson, would tell her students tales of his trickery. According to Anna J's student, Mickey Alkire, Brando removed the hinge pins from Anna's classroom door. When it came time to open it, the entire thing came out of the frame! He also refused to read Julius Caesar in her class because it was “not worth his time.” Ironically, he played Mark Antony in the 1953 motion picture adaptation. Something tells me he ended up reading it after all! During World War II, the Jackson Gym hosted a War Bond Rally. The special guest in attendance was none other than Helen Keller! Though she was unable to communicate with the crowd, her presence spoke for itself. Other notable alumni have included Tom Morello of Rage Against the Machine, MLB player Brett Butler, and WGN-TV News Anchor Mark Suppelsa. To rephrase George Bailey: Merry Christmas, you wonderful old Brainerd Building! Next images: Hallway, classroom, doorway, classroom next to Jackson Gym, peeling walls of the Tunnel , the "Tunnel"
Botany Bay Plantation is not your typical tourist attraction. 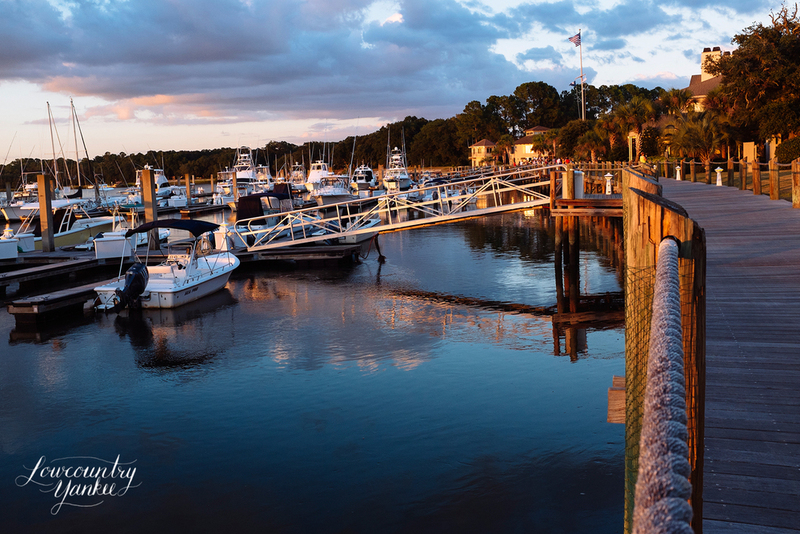 Located on Edisto Island along the Atlantic Ocean, this Wildlife Management area features a maritime forest, historical structures, a picnic pond, salt marshes, and a shell-filled beach. It also happens to be the filming location of the Gullah village/wedding scene in The Patriot. Your first taste of natural beauty comes as you thump down dusty Botany Bay Road. Sun filters through the dense trees lining each side of the dirt lane. 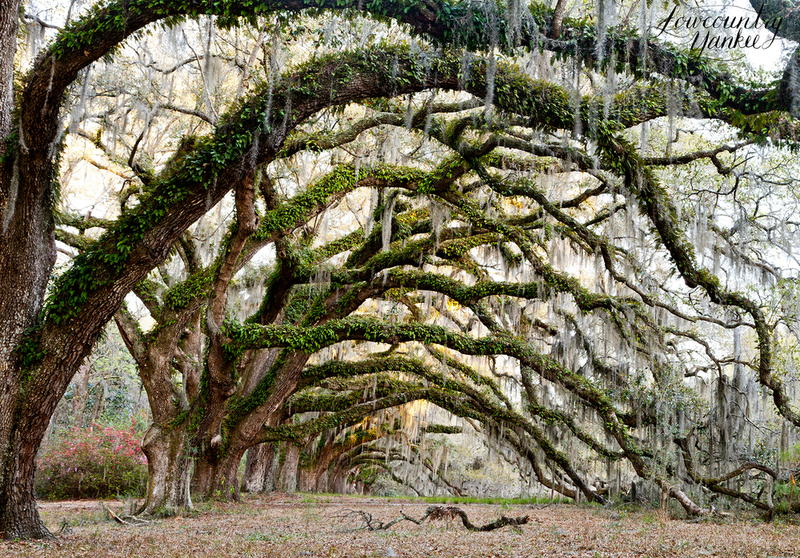 Spanish moss hauntingly drips down from the branches above, like ghosts inviting you to discover this secret sanctuary. As you slowly approach the visitor station, you already feel transported to a primitive world. The park volunteer gives you an interpretive driving map that provides informative tidbits about the sites around the Plantation. Although marked as the last stop on the tour, many people choose to visit the ocean first. After a short walk on a path through the wetlands, you approach the water's edge. Aptly referred to as a boneyard beach, this particular sandy strip is littered with uprooted trees and beheaded palms; a result of beach erosion. Nature and man work side-by-side to shape artistic displays. Weathered roots and branches create ever-changing driftwood sculptures. An abundance of seashells provide ornamentation for pruned palms. At high tide, the sparkling blue sea encloses the withering trees. It makes one imagine that a fantastical Atlantis lies just below the water's surface. 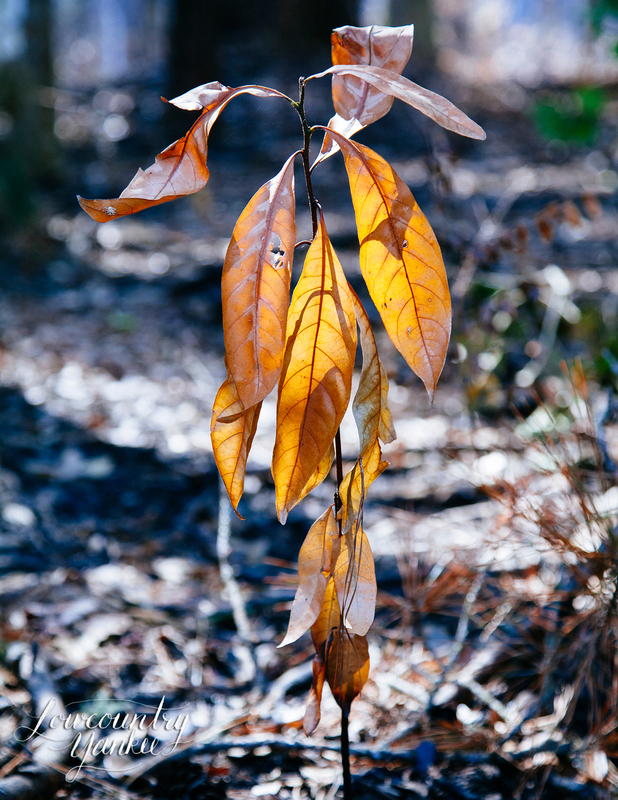 Stay tuned for the next installment where I'll explore Botany Bay's historical structures and woodlands. The midlands and upcountry were blasted with an early bout of winter weather on Saturday morning. Record snow fell as far south as Columbia, coating trees in a thick, white blanket. Growing up near Chicago, I was never a stranger to unpleasant meteorological systems. Whether one contained damaging hail, violent winds, or a debilitating amount of snow, it was an expected consequence of Midwest living. In fact, one of my reasons for migrating south was to enjoy a more temperate climate. However, Saturday's unusual weather phenomenon reminded me of one I experienced last winter right here in the Lowcountry. At the end of January, the state was hit with a dangerous ice storm. Inland, massive, ice-coated tree branches fell, compromising roads and downing power lines. Thankfully, along the coast, we suffered only minor damage, most of which was evident once the spring arrived and the plants failed to resuscitate. The lack of incidence was also attributed to excellent storm preparation. Charleston and the surrounding areas, in effect, completely shut down. Businesses, government agencies, schools, and essential bridges and roadways were closed. People relinquished control to Mother Nature, allowing her to decide when normal life would resume. The storm came in the inky darkness. All through the night I heard the pinging tones of ice drops pattering upon the roof above me, as if it was made of tin. When I woke the next morning, I was greeted by the peaceful silence that often accompanies a fresh snowfall. I looked out my window and was amazed to find fine white sparkles dusting the surface of the earth. Everything above ground was paralyzed in an icy glaze. 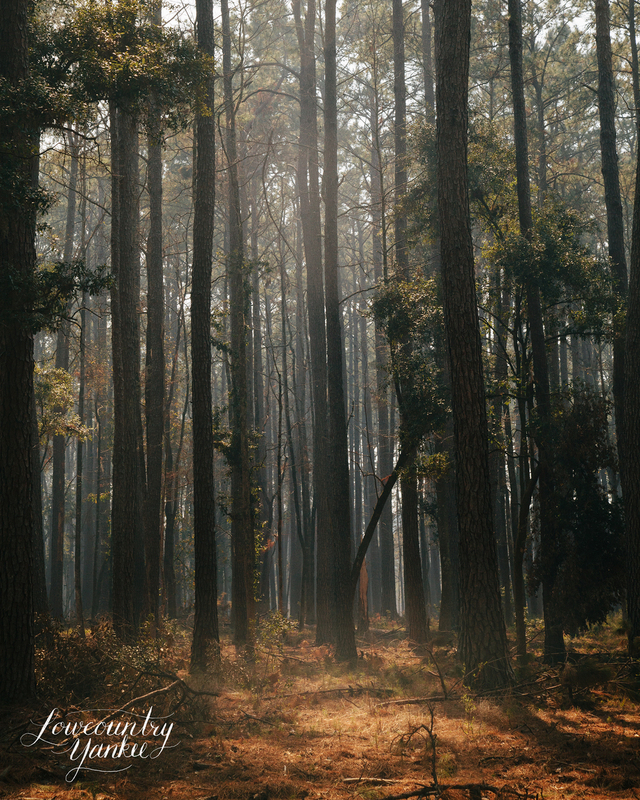 Breathing in the crisp air, I walked outside among the trees surrounding my house. Camera in tow, I was thrilled to capture the effects of this unique experience. It looked as if nature was putting on a lovely ballet that was halted mid-performance. Leaves were elegantly arranged in a motionless arctic dance. Sheath-covered pine needles formed graceful arches and curves. 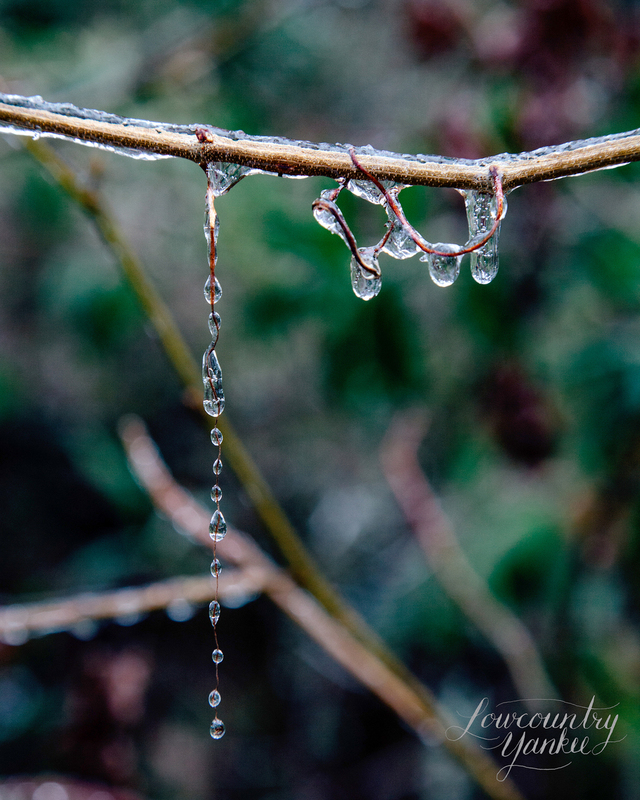 Suspended water droplets clung to vines creating a crystallized corps.